Fikayo Tomori (right) impressed against Leeds. Photo by Jez Tighe. 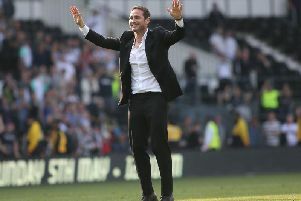 After an opening day win, Derby came crashing back down to earth at Pride Park. Leeds thumped us by four goals to one and throughly deserved their win. That took Derby apart and looked a class act. Tipped by many to be amongst the favourites for promotion, they started fast and never looked in danger of losing the game. Derby did have some chances, but were unable to take advantage of them. We looked very weak in three key areas - left-back where Max Lowe struggled, at centre-half Richard Keogh looked weak and the holding midfield role too gave cause for concern with Joe Ledley not adapting to it with much success. We looked very weak in the centre and to be honest the whole side at times looked very vulnerable. It will take time to convert those used to playing Gary Rowett-style football and Rome wasn’t built in a day, but its important to bounce back as quickly as possible. Fikayo Tomori had a decent enough game in the centre of defence, but we will have to tighten things up in the next series of games. George Evans can play the holding role, Scott Malone will by eying that left-back position and when Curtis Davies returns it could be Keogh that gives way after being outshone by young Tomori. Evans and Malone didn’t feature on Saturday, but it’s surely only a matter of time before they do. Jack Marriott has still to make his debut up front too! Martyn Waghorn had a quiet first game, but the service to him was lacking. Harry Wilson drifted out of the game after a bright opening and Mason Mount too couldn’t make an impression despite working hard through out the game. Wilson will be aware that Duane Holmes and Florant Jozefzoon will both be eyeing a position playing out wide. Let’s not over-criticise the lad though. Its far too early to press a panic button though! The importance of this game is the fact it’s highlighted the areas where we are most vulnerable and better now than later. Also a new playing style with new players will take a little time before the rewards are forthcoming. We travel to Oldham for our League Cup match and perhaps that will give us our first look at Evans, Malone, Holmes and Marriott.